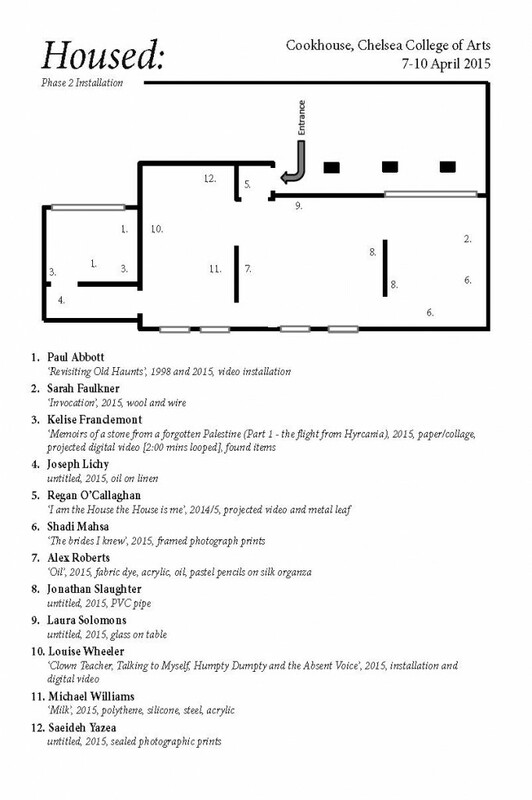 Following a crit with MA Head of Curating & Collections, with head of MA Critical Theory, the curators moved into Housed: and “rearranged the furniture.” Their aim was to push the works to new limits and test the boundaries between artist and curator. Some pieces weren’t re-sited whilst some works were moved. In either case, even a small change resulted in a striking new conversation between works. Every small detailed was carefully considered. The curators knew very little about the artist or the works presented, even though some artists provided a supporting element in a small envelope left near their work… a kind of telegram to the curator. The curators then relied on aesthetic considerations of the site for the work as well was their reading of the work itself. Tomorrow [10 April 2015] the artists and curators will come together for a final shared discussion about the week.